(CNN) - New Zealand won the women's Rugby World Cup Sevens in San Francisco by defeating France, 29-0, in Saturday's final. Michaela Blyde stole the show with a hat trick -- ending the tournament with nine tries in total -- while Portia Woodman and Tyler Nathan-Wong also got on the score sheet in what proved to be a comfortable victory. It means the Blacks Ferns retain the title they won in Moscow in 2013, the inaugural women's World Cup having been won by Australia in 2009. "It's an amazing day," said captain Sarah Goss. "France are a quality team and for them not to score against us is a proud effort from the sisters. "We had one goal and that was to take the trophy back and I can't wait to go home and show it to the New Zealand public." 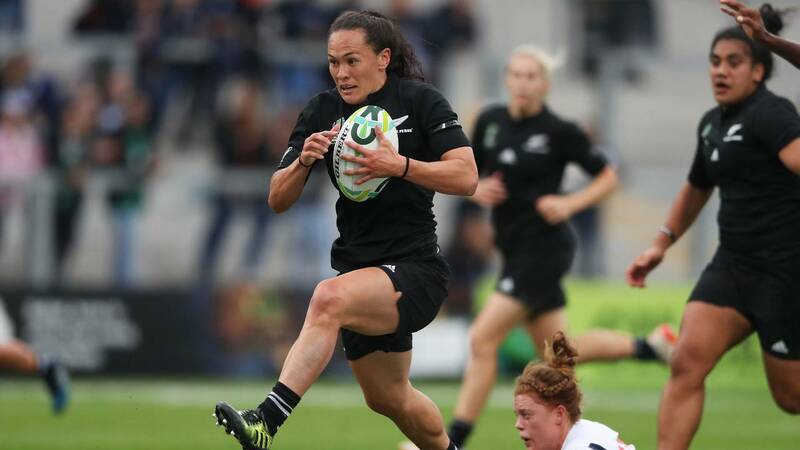 Comprehensive victories over Mexico (57-0) and Ireland (45-0) handed the Black Ferns a semifinal clash with host USA. That proved to be the greatest challenge of the weekend. Trailing at halftime after two tries from Eagles' Naya Tapper, New Zealand scored three in the second period to win 26-21. It was France's best ever result at a World Cup having ousted World Series champion Australia in the semifinal. In a scintillating encounter, Anne-Cecile Ciofani scored after the hooter to give Les Bleus a 19-12 victory. "It's my first silver medal in a World Cup, it's awesome," said Chloe Pelle after the final. "We came here and we wanted to have a medal -- we didn't know what color it would be, but it's great. "We really wanted to have that medal to show everyone that we'd been working a lot to be better and we've proved that yes, they can count on us." There were crowds of close to 100,000 expected throughout the weekend at San Francisco's AT&T Park with the men's event set to conclude Sunday. It was the first time ever the World Cup had been held in a knockout format, with 16 teams playing 32 games in the women's competition. Australia beat USA 26-21 to take bronze, while England recovered from a shocking first-round defeat to Ireland to claim the Challenge Trophy with a 31-5 victory over Japan.